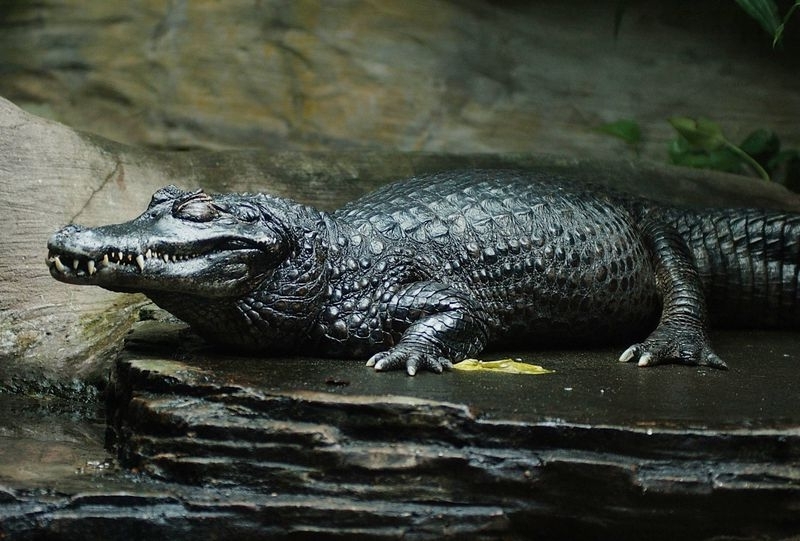 Black Caimans (Melanosuchus niger) are large, meat-eating reptiles that spend most of their lives in the water. They live in freshwater habitats in South America, including the Amazon basin. They live in slow-moving rivers, streams, and lakes in rain forests, and in seasonally flooded savannas. Caimans swim very well, mainly using their tails to propel themselves through the water, and also using their webbed feet. Black Caimans are nocturnal (most active at night). The Black Caiman is up to about 20 feet (6 m) long. It has a bony ridge over the eyes, and black armored skin. It is very similar to the American alligator. Caimans hunt at night; they eat fish (including piranhas and catfish), birds, turtles, reptiles, and mammals. They have about 75 long, sharp, conical teeth, which are used for catching prey (but they do not tear it apart – they swallow their prey whole).